Domestically manufactured continuous loop handle and 8" no-flat solid rubber wheels. Domestically manufactured continuous loop handle and 10" full Pneumatic wheels. Domestically manufactured vertical loop handle and 10" full Pneumatic wheels. Domestically manufactured continuous loop handle and 10" no-flat recycled rubber wheels. Domestically manufactured continuous loop handle and 8" no-flat solid rubber wheels. 24.5" recessed folding nose extension for easy handling of bulky items. Industrial steel handtuck with 8" Recycled Rubber wheels on a high impact polyolefin hub 700lbs. capacity. Industrial steel single pin grip handtuck with 8" wheels and capacities to 800lbs. Industrial steel single pin grip hand truck with 10" Recycled Rubber wheels on a high impact polyolefin hub 700lbs. capacity. Industrial steel single pin grip hand tuck with 10" Pnuematic wheels on a steel hub 530lbs. capacity. 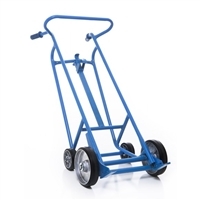 Industrial steel hand truck with 10" Balloon Rubber Wheels and 800lbs. capacity. 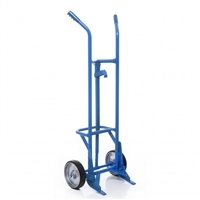 Industrial steel hand truck with 8" Balloon Rubber Wheels and 800lbs. capacity. Capable of Handling both Steel and Fiber Drums.